Once a semester, the Department of Physics and Environmental Science at St. Mary’s University takes students from its Introduction to Geology class to Enchanted Rock — a massive, dome-shaped pink granite batholith near Fredericksburg. 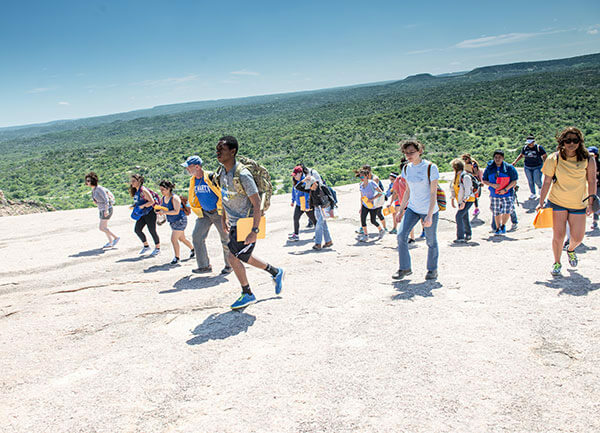 During the field trip, students observe the scenic Texas Hill Country while hiking up the 425-foot Enchanted Rock. The tradition began in 1982, when Geology professor David Fitzgerald, Ph.D., took his class to the historic landmark. Since his retirement, other professors have followed in his footsteps. 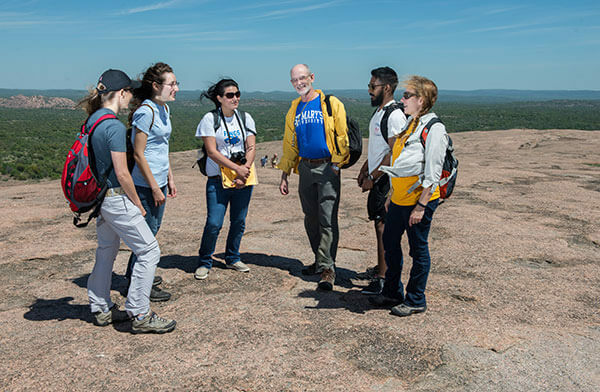 Once atop the windy summit of Enchanted Rock, there’s a palpable sense of awe from students. On a clear day, the view of the oak tree-studded countryside is breathtaking, and wildflowers, cacti and other plants surrounding the trails add to the postcard-like scene. For junior Environmental Science major Samantha Perez, who went on the field trip her freshman year and tagged along again in March, the experience has been beneficial to her as a future scientist. Grant Khan, a sophomore Environmental Science major, shared a similar sentiment. Melissa Karlin, Ph.D., Associate Professor of Environment Science, said it’s visualization of classroom lessons — “letting students see the granite dome or showing them water percolating through limestone rock or letting them hear the calls of two male Golden-cheeked Warblers proclaiming their territory” — that continues to drive the decades-long tradition of Enchanted Rock field trips at St. Mary’s.